The men who are students have a lot to handle. As well as their university courses, there is the C.O.T.C., the Canadian Officer Training Corps. Those who are physically fit are automatically enrolled in the C.O.T.C. This adds obligatory military duties, such as training to use guns, marching, and classes. 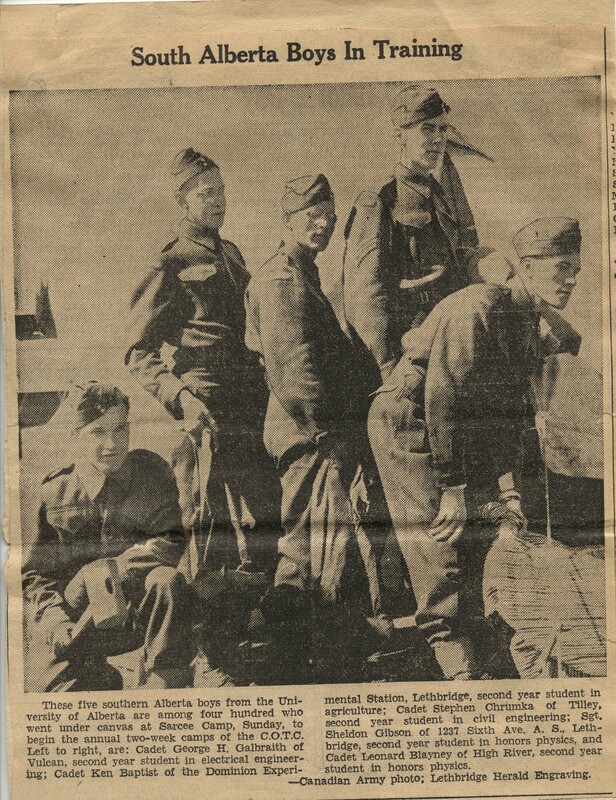 Then when summer comes they must attend the Sarcee Military Camp for two weeks of further training. In the time left they can work at civilian jobs to earn money for the next university semester. Sheldon gets two weeks of leave from his job with Imperial Oil, because he must go to Sarcee. He takes his army training seriously. His picture in our paper makes me proud, but scared too. This war is so terrible. I wish people would not say mean things about the C.O.T.C. boys. I understand that families with boys already overseas might resent able-bodied university students who are safe at home, but don’t they understand that the military is training these young men to fill positions the army needs? Their turn will surely come. Dad and I came to Calgary last night, to spend the weekend with Mom and Doris. Sheldon knows I’m here, and will get in if he can. Finding a phone without a long waiting line is a problem. Sheldon is here! He arrived on his second-hand bicycle just in time for lunch. Most of the afternoon is ours. We visit, laugh, go for walks and for banana splits. Then comes the time for him to leave. It’s hard to see him go. “When I get there, and can find a phone that is free, I’ll call.” With that he is gone. It’s a bad night, followed by a bad morning. I am keeping busy helping Mom in the garden. She thinks I’m quiet because Sheldon is gone. Little does she know my worries. The phone is ringing! “I’ll get it, Mom,” I call, and run for the house. He is laughing so hard he can hardly speak, but finally gets control of himself. With that he pulls me into his arms. We kiss, then run down the street like a couple of kids. As we near the drug store with the snack bar, we slow down. Casually we stroll in, climb up on stools at the snack bar and Sheldon orders. The jukebox is playing one of our favourite songs, “I’ll get by, as long as I have you.” The sun is shining, and all is right with my world. This too, I realize, is a day to remember! 8 Responses to How Did You Spend Your Summer? Your title resonates all through this poignant story, inviting us to contrast your student summer break: its worries, joy, peaceful work, and preparations for war, with changes in Canadian life since then, and with some things that never change. Your writing sparkles with immediacy, in contrast with the faded photograph. You make me glad to pause, to cherish, to remember, in ways I do too seldom. Thank you for a beautiful photographic memory! Laurna – It does get tricky – the pictures and memories transport me back to my youth, yet I am living in a far different time. Both are to be cherished and appreciated, the two sides of every coin that life offers. Pretty darn sure I never heard that story Mom, even in an edited form! The photo I think not but I’m not 100% sure. It seems vaguely familiar. Thanks again for the recollection. You’re right, Ralph – the disappearance into the ditch was a narrow squeak and we did not talk about it. The effect of the war on our lives was very real, even though it ended just before Sheldon would have gone for his basic training, and then overseas. Too many others were not so fortunate. Do you remember seeing his sergeant’s stripe? I still have it, in one of the binders of memorabilia that Isabel put together. Next time you are here you can see it. I hope so .. and the youth! Were we ever that young? Thanks, Eveline. Marjorie thanks so much for sharing your memories. It brought back memories that my mom shared of her & dad’s contributions to the war effort. One of the very pleasant side benefits of writing, is renewing links with old friends. It is nice to know you read my blog. Linda – The war did affect all of us, didn’t it? The uncertainty of it all could not be ignored. Two things often happened – we grew up a bit sooner, and also enjoyed the days as they came. For us, the war ended sooner than was expected – but that’s another story!